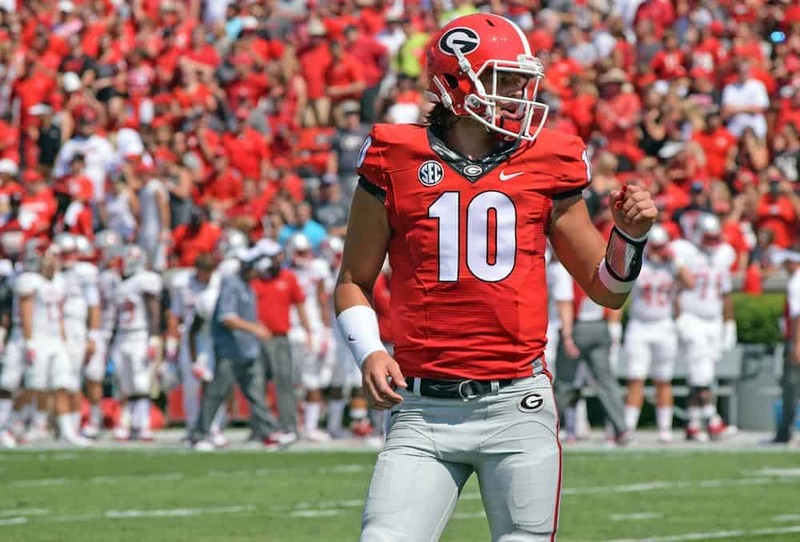 The ranking polls fluctuate greatly in the early weeks of the season, and Georgia is seeing that early on. The Bulldogs began the season ranked at No. 18 in the preseason Amway Coaches Poll, and jumped to ninth after a convincing victory over North Carolina. But after fending off FCS foe Nicholls State by a narrow 26-24 tally, Georgia drops yet again. The coaches’ poll was released on Sunday after the second week of action, and the Bulldogs have fallen four spots to No. 13. Georgia remains the second-highest ranked SEC team, only behind Alabama who is ranked as the nation’s best team. Aside from Georgia and Alabama, six other SEC teams are also ranked: Tennessee (No. 15), Ole Miss (No. 17), Texas A&M (No. 20), LSU (No. 22), Florida (No. 23.) and Arkansas (No. 24). Georgia also began the season in the AP poll ranked at No. 18, and jumped nine spots after the victory over the Tar Heels. However, as the second week of action has come and gone, there is a bit of separation between the two polls. The Bulldogs have been placed at No. 16 as week three of the college football season has arrived. Georgia is also no longer the second-highest ranked team in the poll comprised of rankings by numerous media members. Tennessee, who began the season ranked ninth, has moved up to No. 15 and leapfrogged the Bulldogs after their win over Virginia Tech on Saturday. The poll is comprised of eight programs from the SEC as Alabama (No. 1), Texas A&M (No. 17), Ole Miss (No. 19), LSU (No. 20), Florida (No. 23), Arkansas (No. 24). The AP poll also dropped another highly-ranked team after squeaking by a lesser opponent, as Clemson dropped three spots from No. 2 to No. 5 after beating Troy 30-24. The fluctuation in the polls shows how it’s taken week-by-week, but as the season progresses, the movement becomes steadier.